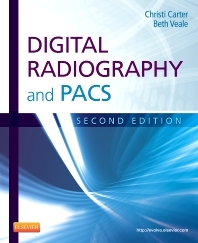 Written with the radiography student in mind, Digital Radiography and PACS, 2nd Edition provides the latest information on digital imaging systems, including computed radiography (CR), digital radiography (DR), and picture archiving and communications systems (PACS) as well as the data required by practicing technologists who are transitioning to digital imaging. Coverage of digital imaging and PACS is at just the right level for student radiographers and practicing technologists who are transitioning to digital imaging. Chapter outlines, learning objectives and key terms at the beginning of each chapter orient readers to the chapter content and assist with organizing study and comprehension. Bulleted summaries recap the main points of the chapter, ensuring you focus on the most important concepts conveyed by the chapter. Review questions at the end of each chapter are linked to the chapter objectives. Carter, Christi E. and Beth L. Veale. This text for entry-level radiography students covers the latest digital imaging systems, including computed radiography (CR), digital radiography (DR), and picture archival and communication systems (PACS). It offers concise, step-by-step image acquisition guidelines for CR, DR, and PACS workstations, as well as detailed exposure guidelines and quality control practices for obtaining the best possible radiographs. Effective techniques for digitizing film, printing images, and preparing image files are described. Learning features include chapter objectives, key terms, summaries, and review questions. A glossary and an abbreviation table are also included. The art program features b&w radiographic images and photos of equipment. Although the book is intended for entry-level radiography students, it will benefit anyone who needs to understand why digital imaging works. Carter directs the Radiologic Sciences Program at Brookhaven College. Veale teaches radiologic sciences at Midwestern State University.